​Brighten or dim any light in the room—or the entire house—with a single touch or voice command. Or allow lighting to respond to your life, without any touch at all. Smart lighting provides convenience, energy efficiency, and added security. And it’s smart enough to handle more than just the lights. A simple tap can lock the doors, ramp up the temperature, and start a movie—all at once. ​It’s not just smart, it’s brilliant. ​Make your house appear occupied while you are away. ​Raise or dim any light in the room or the entire house with a single touch. Automate your lighting to respond to your schedule without any touch at all. It’s not just smart, it’s brilliant. ​<--- This informative video from Control4 gives a nice overview of what is possible with Smart Lighting. Wireless lighting provides sophisticated style in sleek color configurations, guaranteed to complement the beauty of your home. Perfect for those building a new home or undertaking a remodel, centralized lighting allows you to move your lighting controls elsewhere, like a closet, allowing you to replace banks of switches with stylish and elegant keypads. 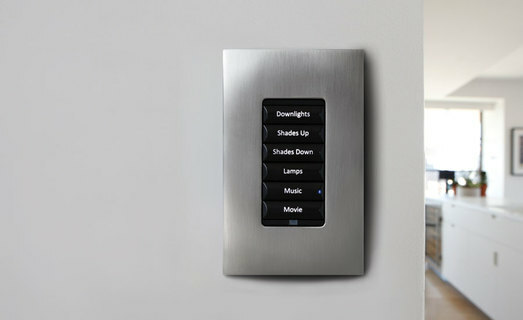 Button customization enables one-touch control of lighting of course, but also entertainment, security, climate and more. Ask HomeTech if a centralized lighting approach might be right for you. Smart lighting knows no boundaries—from under your roof to under the stars. Activate a lighting scene that lights up the deck and emphasizes water features in the backyard. Exterior lighting can turn on-and-off in unison with the sunrise and sunset. ​Set perimeter lights to flash if the alarm system is triggered, drawing attention to unusual activity.